You might want to look at The Elements of Computing Systems , also known as "nand2tetris", It will start you out with nothing more than a NAND logic gate and you'll build the whole stack, from ALU to CPU to compiler to simple OS. Quite fun and kept reasonably simple. There is a book "The Elements of Computing Systems: Building a Modern Computer from First Principles" that is often called "From NAND to Tetris". This has you building a computer simulator from the ground up (NAND to Tetris). There is a website and a Cousera course. And a TED talk. Since we already know how to implement the elementary versions of these gates, the implementation of their n-ary versions is simply a matter of constructing arrays of n elementary gates, having each gate operate separately on its bits. This implementation task is rather boring, but it will carry its weight when these multi-bit gates are used in more complex chips, as described in subsequent chapters. So besides writing a trivial script in Python to avoid all that typing, you're not missing anything. There's a great textbook called The Elements of Computing Systems: Building a Modern Computer from First Principles by Noam Nisan and Shimon Schocken, which serves as the basis for a university course taught by the authors called Workshop In Computer Construction - From NAND to Tetris in 12 Steps. This course is also taught at other universities under different names. There's a 10 minute introduction on YouTube and a 1 hour Google TechTalk on Google Video, both by the author himself. Don't let the title "Computer Construction" fool you. By "computer", the author does not just mean the rectangular plastic box on your desk, he means the entire computing system, from the individual logic gates up to highest-level application programming. 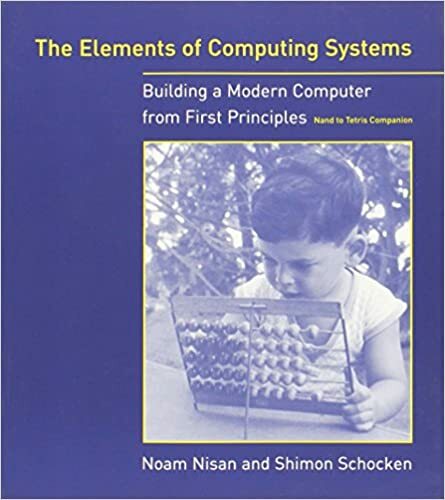 Are you thinking of "The Elements of Computing Systems: Building a Modern Computer from First Principles" <http://www.amazon.com/Elements-Computing-Systems-Building-Pr... by Noam Nisan and Shimon Schocken?